Vascepa is essentially purified fish oil. Its active ingredient, icosapent ethyl, is an omega-3 fatty acid derived from eicosapentaenoic acid (EPA). Omega-3 fatty acids are a type of “good fat” that reduce triglycerides in the blood. When triglycerides are too high, they can increase the risk of heart disease and pancreatitis. According to the American Heart Association, triglyceride levels should be at or below 100 mg/dL. Vascepa works by decreasing the production and release of triglycerides in the liver and increases clearance of triglycerides from the blood stream. Vascepa, in combination with a healthy diet, helps lower triglycerides in adults with severely high triglyceride levels (≥500 mg/dL). The reduction in triglycerides seen with Vascepa was not associated with increased LDL-C, which is a key indicator of “bad cholesterol” in the blood. The effect of Vascepa on the risk of pancreatitis in patients with severely high triglyceride levels has not been determined. The effect of Vascepa on heart problems in patients with severely high triglyceride levels has not been determined. The active ingredient, icosapent ethyl is a form of fish oil that has been purified in a lab. Fish oil comes from fatty, cold-water fish. 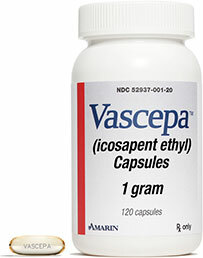 Vascepa is the first FDA approved drug produced by Amarin Pharmaceuticals. Vascepa is similar to Lovaza, which is also an Omega 3 fatty acid used for patients with high triglyceride levels. However, unlike Lovaza, Vascepa does not increase LDL levels. Vascepa should not be taken by people allergic to fish or shellfish. Vascepa should be taken as two 1 gram capsules twice daily with food (4 grams per day). Vascepa was studied with warfarin, atorvastatin, rosiglitazone and omeprazole, which share a similar elimination pathway, and no significant drug interactions were seen. Omega-3 fatty acids may increase the time it takes for blood to clot, increasing the risk of bleeding. Patients treated with Vascepa who are also taking a medication that increases bleeding should be monitored periodically. The price of Vascepa 1 gram capsules is between $211 to $264 dollars for 120 capsules. Save on Vascepa prescriptions cost by signing up for the Vascepa Savings Card. Discount coupons are also available form many pharmacies.